The Generali Group’s in-house magazine, “Il Bollettino“, was launched in 1893, and this year it reached its milestone 125th anniversary (a few periods in which publication was suspended notwithstanding). As one of the longest-running Italian corporate magazines still in print today, it is one of the largest and most detailed historical sources in the Archive’s possession. Its resources are there for the benefit of students, researchers or simply those with an interest in the history of the Company and the insurance industry more widely, as well as to provide national and international socio-cultural context for the almost two hundred years of Generali’s existence. It was preceded, in 1880, by the “Mittheilungen der k.k. Allgemeinen Assekuranz in Triest”, compiled by the Head Office for restricted internal use [described as “vertraulich” (“confidential”) in the preface of the first edition] and intended for the German-language territories. The publication, which ran until 1914, followed the example of the “Mittheilungen”s, with instructions for the Company’s agents that Wilhelm Lazarus, head of the general agency of Hamburg, had been printing out since 1860. From 1933, “Mitteilungen” became the name given to the magazine of the Vienna branch office. 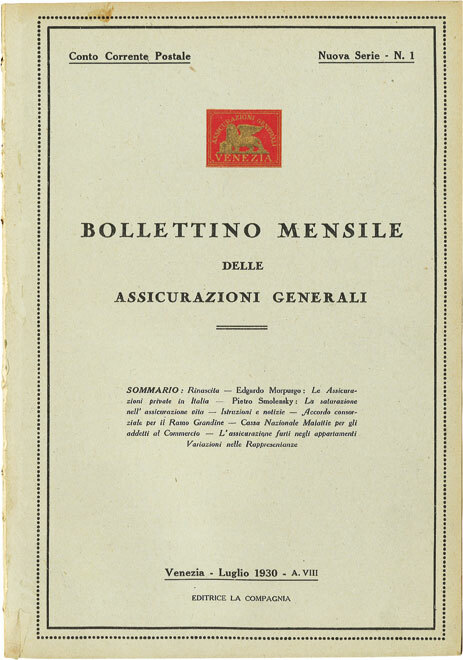 “Il Bollettino” (which until 1920 had the longer title of “Il Bollettino delle Assicurazioni Generali di Venezia”) served as an informational tool for the Veneto Head Office for the Company’s Italian staff. Generali’s two-pronged structure also extended to its internal communication tools: “Il Bollettino” and “Il Notiziario” (the Italian-language version of “Mittheilungen”) were published concurrently until 1937, long after Trieste was passed into Italian hands in the aftermath of World War One. This was a clear indication of their perceived value to company life. “Il Bollettino” was printed on a monthly basis from March 1893 until August-September 1912, after which production was more sporadic (seven from August 1914 to March-April 1915, 12 in 1920, and one special edition in 1919). It consisted of a few pages with basic binding, providing news divided by sector, with the goal of informing employees and agents of the Company’s performance, internal appointments, and the most up-to-date information from the insurance industry. The pages of the Head Office’s “Mittheilungen” publication, also published in Italian from 1911 onwards as “Il Notiziario”, were equally basic. In 1930 printing was renewed for “Il Bollettino” (from July) as well as “Il Notiziario” (from March), and both were significantly expanded under the management of Giuseppe Stefani from Trieste, although the editorial board of “Il Bollettino” was based in the Venice Head Office. Publication of the new “Il Notiziario” went from monthly to periodical, and its mission became to gather “all the disparate voices of the wider Generali family” in one place, with an emphasis on those abroad (preface of the first issue). “Il Bollettino”, on the other hand, came out every month, and was intended for employees and agents from around Italy, providing information about “everything they might need to help stimulate, advise and support them in their daily lives”. The two magazines had different sizes, graphic designs and features until June 1937, when “Il Notiziario” was merged with “Il Bollettino”, bringing more eye-catching images with it, as well as articles about successful policies, purchases and new company buildings. 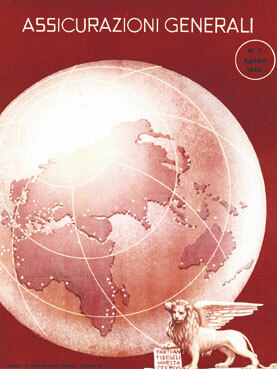 The larger format and the use of colour which characterised “Il Notiziario” were carried over to the new “Il Bollettino” in 1940, with the symbolic lion set against a globe adorning the cover of the magazine until 1970. The printing of the magazine was halted in 1943, before starting up again with a fifth series in 1950, with editors and editorial board based in Trieste. Over the following years, it took on a clear identity, with sections dedicated to galleries of people insured by the Company, blue inserts dedicated to insurance-related articles drawn from celebrated literary works, and pink ones for sales competitions among Italian agencies. The cover of the sixth series, launched by Ulcigrai in 1971, carried the company logo with the lion which the Company had decided to use as its symbol in Italy and abroad. With Ulcigrai’s passing in 1992, Armando Zimolo was appointed editor of the magazine. The nineties saw a more modern style introduced, with the use of a lot of colour images to brighten up the pages. 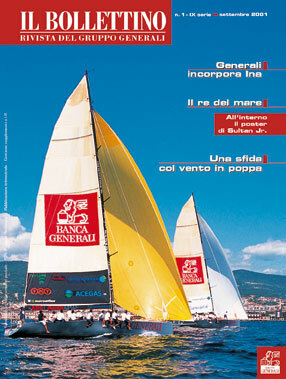 In 2001, “Il Bollettino” became “the magazine of the Generali Group”, expanding its horizons to a global audience. Ever since 2009, it has also been published in English, and since 2013 a digital version of the magazine, optimised for online reading and translated into several languages, has been released alongside the traditional paper version. The first three series are published here: Series I (1893-1912), series II (1914-1915) e series III (1920).